This patient had been to several dentists and had several procedures done to her front 4 teeth. She originally had spaces between her upper 4 teeth and wanted to know her options to close them. When we saw the patient for her complimentary consultation appointment, she had bonding (composite material) placed on her upper 4 teeth with another dentist. She did not like the result. As you can see in her before picture inset to the left, the bonding was several different colors on the front 4 teeth and the gum levels were not even and very low. Dr. Friedman did some gum recontouring with his laser on the front 4 teeth making the gum levels even and taking away excess gum tissue. The patient then did the Zoom in-office whitening system on her entire mouth. 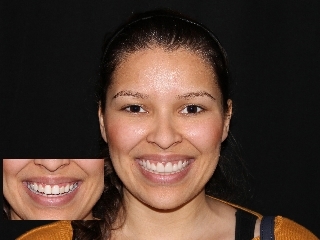 After achieving her ideal shade, Dr. Friedman placed upper 4 porcelain veneers. With 3 visits, this patient final got the results for her smile she had been searching for. What a GREAT smile! !